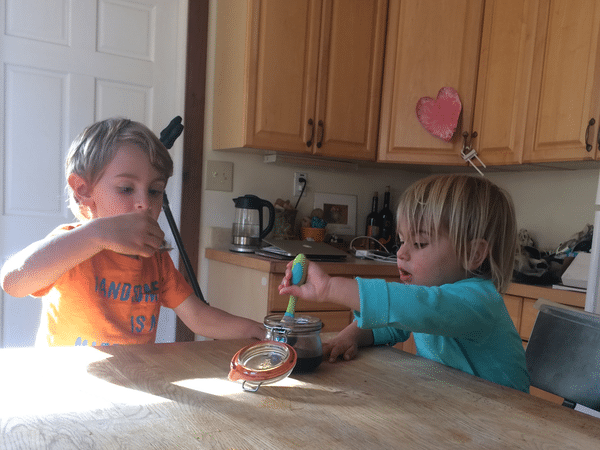 Every year around this time, Annmarie and the kids play around in the kitchen and make elderberry syrup for the whole family. It helps to keep their immune systems strong through the fall and winter months. 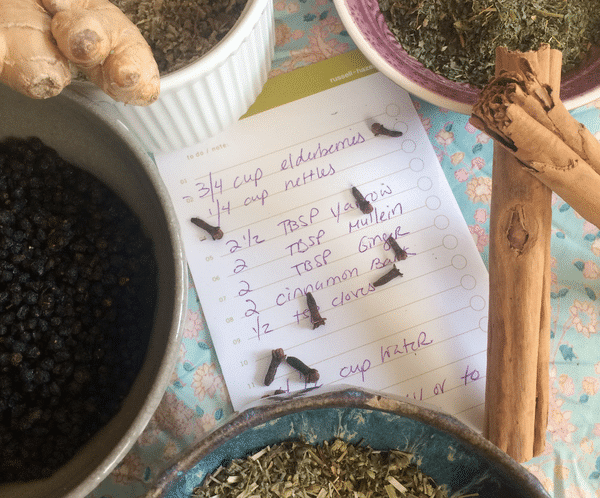 This year she wanted to revamp the old recipe and give it some extra herbal love. 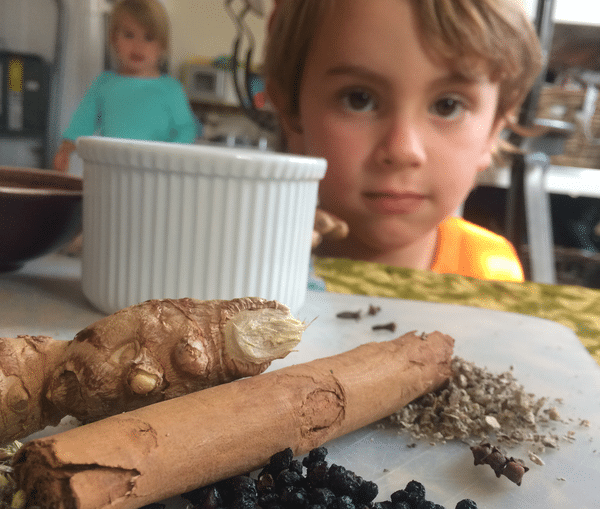 Annmarie and Aubrey, ASC’s herbalist, came together to add a couple new herbs to boost the healing power of the syrup and turned the stove-top recipe into a crock pot method that keeps the herbs at a steady temperature. Elderberries have been used for over 2000 years as a base to make a syrup to take internally for all sorts of colds, flus, and coughs because it tastes good along with being high in antioxidants. Used internally, ginger has a rich healing history both fresh and dry. Dry ginger was traditionally used for stomach aches while fresh ginger, like we’re using, is great for respiratory issues. Cinnamon is traditionally used internally by Traditional Chinese Medicine practitioners for warming the body by moving the blood. The idea that our blood feeds our bodies is ancient so to “move the blood” when someone is sick is a way that traditional healers help to clear out illness. Cinnamon is also thought of as a synergist both in flavor and to bring all of the ingredients together to work in harmony. Mullein is used internally by herbalists for all things lung-related. Working with a plant based on its appearance is called the “doctrine of signatures” and this is one of the plants that gave herbalists the idea that it could be used for the lungs based on its shape—the leaves are really large and lung-shaped. This plant is great for coughs, especially hard and dry, because it helps to soften internal mucosa and to loosen and expel phlegm. Yarrow is another herb that’s been used for centuries and is considered a panacea by healers all over the world. It has a lot of amazing benefits for the body but we’re using it internally in our syrup because it’s gentle enough to be a tonic and strong enough to stimulate blood flow, kill off bad bacterias, and increase secretions throughout the digestive system. Nettle is a well-known vitamin and mineral-rich plant boasting constituents like calcium, iron, silica, and vitamin C, K, B, and E. It has been used internally by herbalists for ‘building blood’ which basically means that it’s so jam-packed with the things our bodies need that our blood fills out and can feed our bodies better. Raw honey is a natural throat soother, perfect for a dry, winter cough. Use raw honey internally to get the most benefits. Wait a year before giving honey to your young ones! Pour into airtight glass containers. Do you have an elderberry syrup recipe you love? Let us know in the comments below. 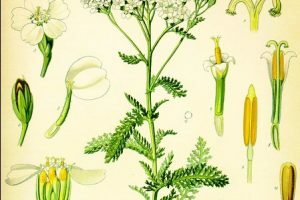 Is Yarrow, nettles and Mullein safe for children? 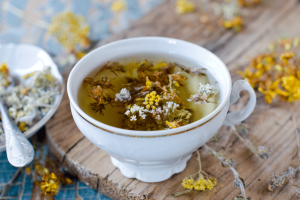 What are the benefits of these herbs? Can you can this ? Unfortunately, we’re not sure! for orders within the US, we suggest working with a company like Pacific Botanicals but because you’re out of the country, it could be difficult to import herbs. We would suggest checking out a local store to see if they might be able to direct you to a place where you can purchase these herbs. i have a couple of questions. How long will this last and does it need to be refrigerated? You don’t need to put it in the fridge if you don’t want to, but you’ll want to use it up pretty quickly that way. If you refrigerate it, it will last for several weeks. How much do you use and how offen? Hi, how long would this stay good for, and should it be stored in the fridge or at room temp? How long can you store the elderberry syrup? What is the recommended serving size? Is this something you can have everyday? Thanks for the recipe! Yep, you can use it every day. It’ll stay good for a few weeks, especially if you put it in the fridge.